Trinity Installation Team Reaches Heathrow T3 Milestone! 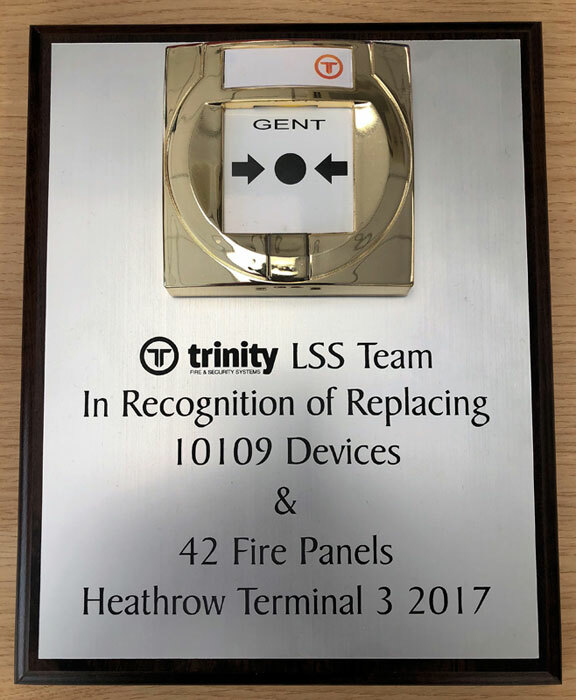 Trinity Fire & Security Systems are extremely proud to announce a major milestone has been reached on the Fire Alarm and PAVA upgrade within Heathrow’s Terminal 3 building. Following nearly two years of hard work all of the ‘installation’ works have now been completed. During the ‘installation’ phase the project team have changed out in excess of 10,000 Fire Alarm devices, whilst also undertaking the installation of 42 new Fire Alarm Panels and 18 PAVA racks in 25 locations. “I would like to extend my thanks and appreciation to the Trinity team for the diligence and work ethic that continues to deliver quality products. This ethos is displayed by the management and throughout the ranks of the organisation, something Trinity Fire & Security Systems should be very proud of”. As a gesture of thanks, and to provide recognition for all the hard work that has been undertaken to date, the Project team were presented with a plaque to record the outstanding project milestone.